Like the Roots before them, the Crown City Rockers blend live R&B-laced instrumentation with hip-hop finesse. Following the unfortunate disbanding of the goodtime old school rap-influenced LA crew Jurassic 5 in 2007, the Oakland-based quintet Crown City Rockers (formerly known as Mission) try their hand at becoming the new torchbearers of socially conscious, Golden Age-tinged hip-hop with their third effort, The Day After Forever. Like the Roots before them, emcee Rashaan Ahmaad, bassist/producer Headnotic, keyboardist Kat Ouano, drummer Max MacVeety, and DJ/programmer Woodstock blend live R&B-laced instrumentation with hip-hop finesse. On the kick-drum-heavy opener, “Break”, Ahmaad spouts raise-the-roof rhymes over scratchy battering-ram horn stabs. Meanwhile the pop ’n' lock beat-driven “Soul”, which unashamedly hijacks the chorus made famous by Eric B. & Rakim’s “I Know You Got Soul”, functions as a melodic keyboard-led nocturnal relaxer evocative of A Tribe Called Quest’s “After Hours”. The seemingly Blackalicious-inspired spitfire flow and song structure of “Astroshock” finds Ahmaad throwing out lyrical jabs over Ouano’s spacey keyboard and MacVeety’s military march-like snare. Almost midway through the album, however, the creative sheen behind The Day After Forever begins to tail off a bit with songs like the paper-thin love jam “Kiss”, with its monotonous retro '80s Bobby Brown-esque groove and an insipid and vocally challenged hook by the pop-singing newcomer and MySpace diva Silya. While much of the snappy rhymes by Rockers lead vocalist Ahmaad are both catchy and vibrant, a small number of his vocal refrains feel surprisingly flat -- for example, the bland chorus line of “Cruisin’" and the coolly crafted but exceedingly repetitive chant on “Let’s Love”, which wholly fail to complement the group’s lively musical arrangements. What’s more, Ahmaad has a dirty habit of exploiting the hooks belonging to other, more accomplished groups in hip-hop. For instance, like the aforementioned lift of Eric B. & Rakim’s choral break, the rapper attempts to put a new spin on another memorable hook with “Clap Your Hands”, where he performs an awkward, and markedly similar rework of the original Meters sample used 16 years earlier by A Tribe Called Quest on their song of the same name (featured on their 1993 old-school East Coast masterpiece Midnight Marauders). Ahmaad’s blatant chorus-line rip of such eminent hip-hop cues may seem cliché, and more significantly, unfortunate given his more unique work on the Rockers’ sophomore release, Earth Tones (Gold Dust, 2007). However, as most Crown City songs go, “Clap Your Hands” and “Soul” are in no way doomed by the trappings of sheer banality. Both are still musically and lyrically articulate. One of the more accessible tracks on Forever is the R&B burner “Make It Hotter”, on which the group pays homage to the Barry White brand of '70s orchestral funk while a strong boom-bap beat lays a head-rocking rhythmic foundation. The inner-city soul-sounding introspection of the confident “That’s Life” sees the Rockers, accompanied by vocalist Jason Jasper, demonstrate their proficiency as exceptional musicians. MacVeety’s reserved yet ardent drumming couples with Headnotic’s calm, poignant bass. Ouano’s emotional piano lays the groundwork for crooning neo-soul man Jasper, and Ahmaad thoughtfully muses on the struggles of his youth, fallen heroes, and hope for the future. The warm, quiet aura of “Forever Song” brings the record to a peaceful and apt close. 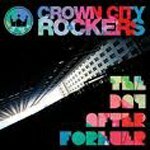 While the Crown City Rockers’ latest is in no way destined to be the next De Le Soul Is Dead, neither does it retain the kind of musical panache that would afford it a strong following and a place in the hip-hop history books alongside the Digable Planets’ jazz-accented Reachin’ (A New Refutation Of Time And Space). But at least the Rockers are earnest in their attempt to bring the old-school vibe back to the forefront of rap music. And with an industry overrun by a crunk-a-fied, Auto-Tuned swagger, who can blame them for trying?